There have been several Hazel’s Diary quilts appearing all over the place, now that the Block-of-the-Month is finished running, and the book has been out for awhile! 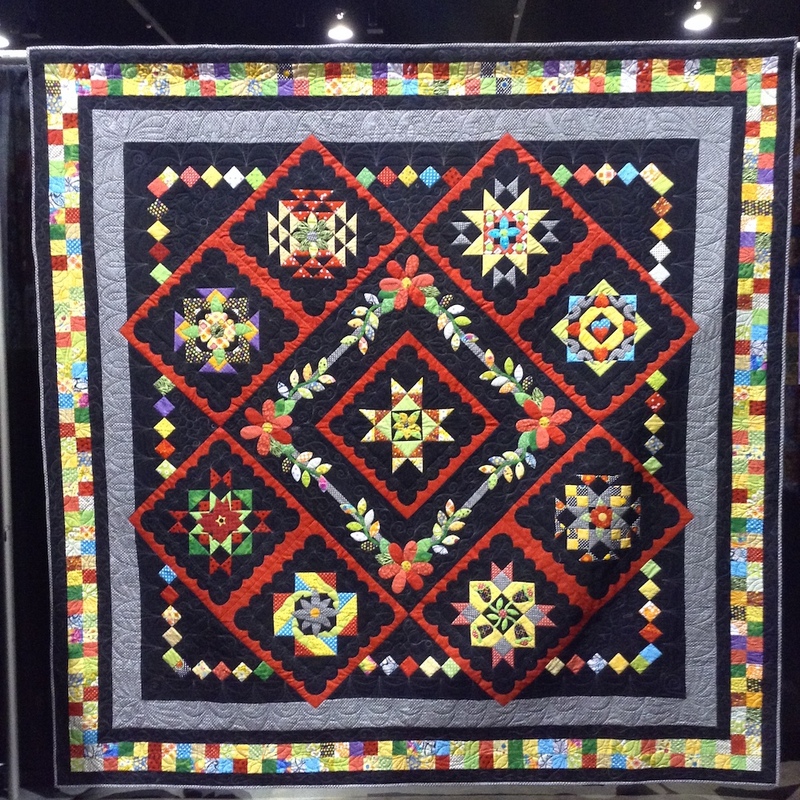 I’ve spotted several at various quilt shows I’ve attended, and some makers have even sent me pictures. 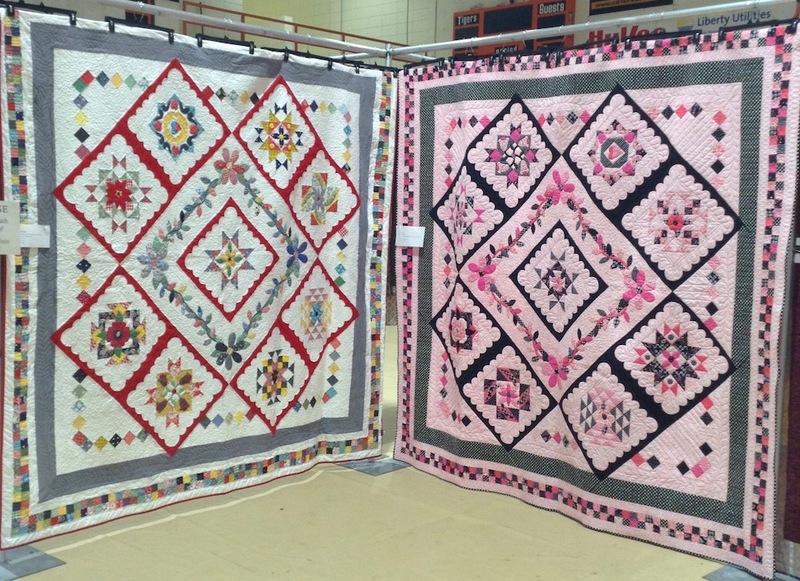 I’m thrilled to get to share some of these quilts with you! First up, I’ll show you a pair of them hanging together at my guild’s annual quilt show. The one on the left was made by my friend, Cindy, and the one on the right was made by my sister, Katy. You can see more pictures of Katy’s version, which we’ve named “Hazel Meets Elvis” in this post HERE. This version by JoAnn Borchelt done in all 1930s reproduction fabrics has such a soft look to it. 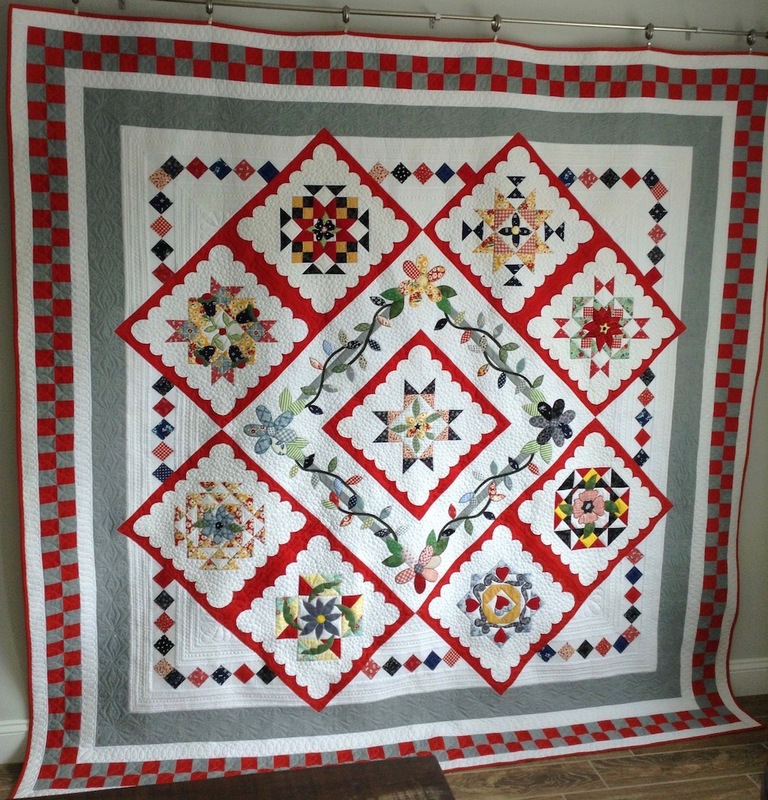 JoAnn’s quilt was expertly quilted by Jane Bromberg. I found out through Instagram that Maria was making a beautiful version of the quilt, and when I went to a retreat in Minnesota last summer, I found out that Maria lives close to where we were, and she came over to visit and meet all of us retreaters, AND then . 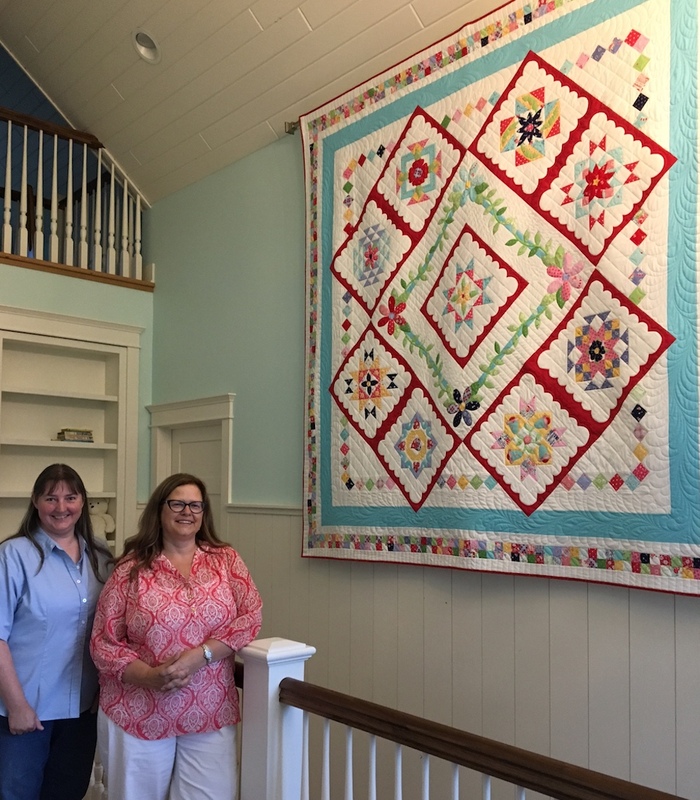 . . she invited us out to her house at the lake for dinner, and we got to tour her gorgeous home and see her quilting studio, and I got to see her quilt for myself, hanging in her stairwell! How often would something like that actually happen? It was so unreal — and so fun — and Maria is wonderful! So is her quilt — I love her turquoise border in place of the gray, and I’m really wondering why I didn’t think of that! 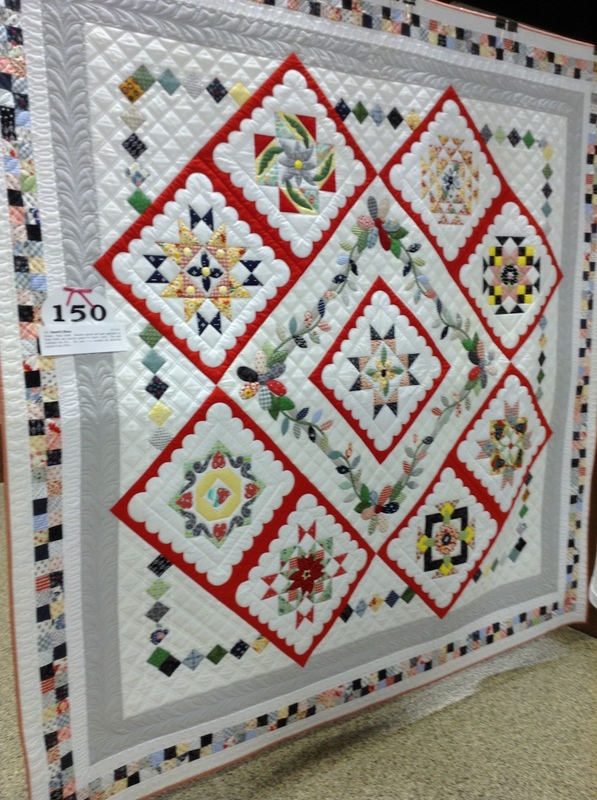 Maria’s quilt was wonderfully quilted by Rebecca Silbaugh of Ruby Blue Quilts. And Maria knits, too — such gorgeous creations — if you’re on Instagram, go follow her @quiltmomoffive — you’ll love her as much as I do! 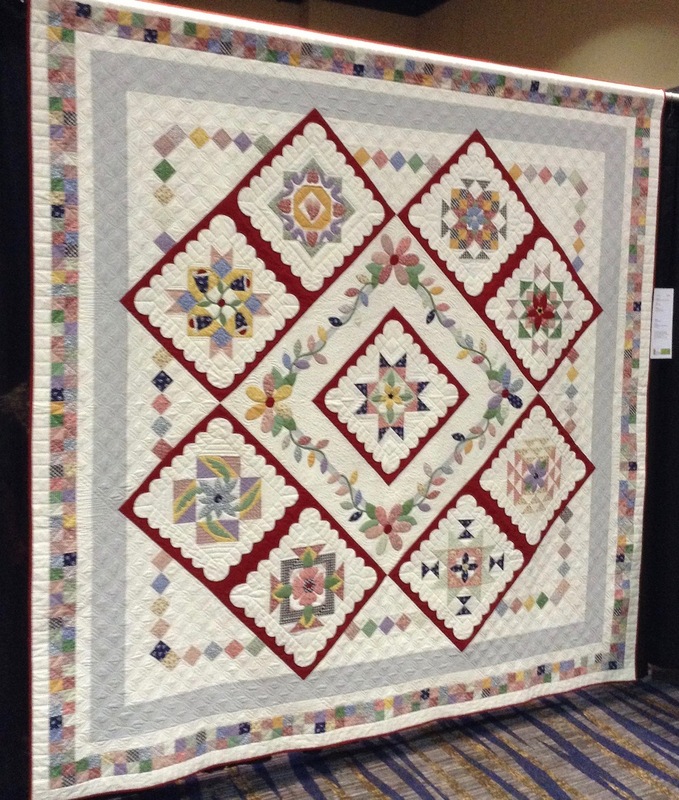 This version was made by Paula Smith, and quilted by Becky Collis (find her at Collis Country Quilting on FaceBook), and I spotted it hanging in the Marshall, Missouri, quilt guild’s annual show last year. So fun to see, and great work by both of these gals! A couple of my friends have made their own versions, too. My friend, Linda, made her outer border checkerboard red and gray. I got to quilt this one for her! And Jeannie made her version with an entirely different border, which I really love, too. All the extra red is wonderful, as are the scrappy squares set on point. 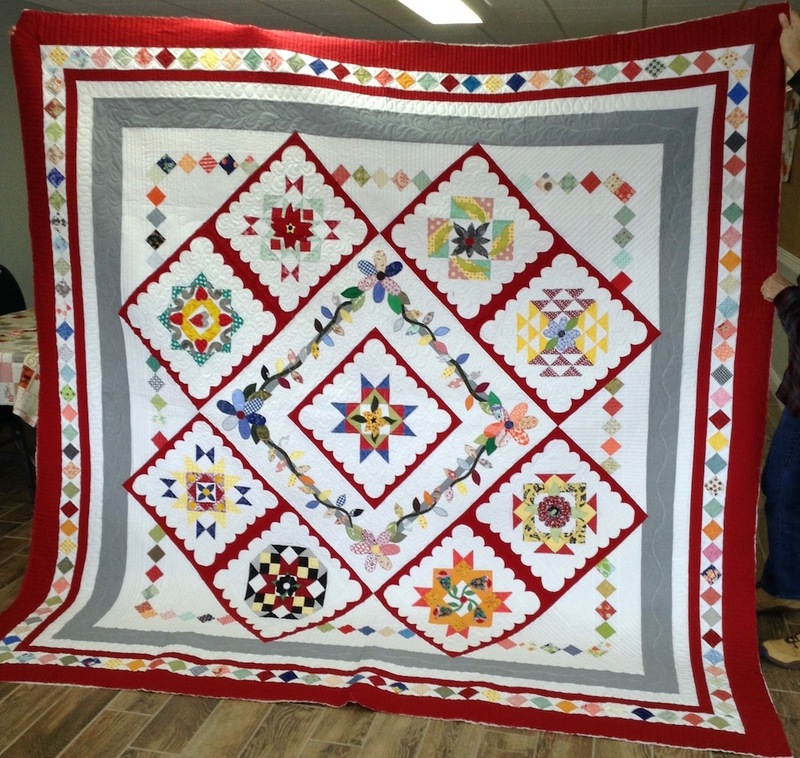 Jeanie’s quilt was quilted by Jessica Defibaugh at Sew Sweet Quilt Shop. Very inspiring, huh? I really love seeing the personal touches and the spin-off ideas that all these quilters put on their quilts. If you’ve made one of your own, I’d love to see it — send me pictures or links! It’s such a wonderful design – looks vintage, fresh and new. No wonder so many are making it. Congrats, Shelly and thanks for the treat of posting these.